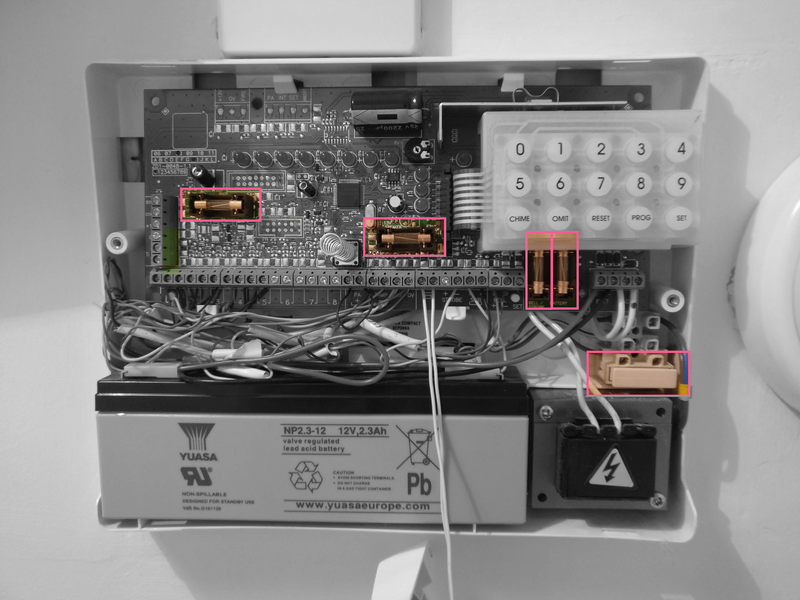 A long time ago our alarm box died and I thought it was time we diagnose an fix the issue. DO NOT ATTEMPT TO COPY IF YOU DON’T KNOW WHAT YOU ARE DOING. CONTACT AN ELECTRICIAN OR ALARM INSTALLER. We will be opening a delicate box with potentially live mains power and could cause damage to yourself or the panel. The battery in the alarm has died. A fuse in the alarm box has blown. There is a fault with the incoming power to the alarm box. There is a fault with the main board of the alarm box. 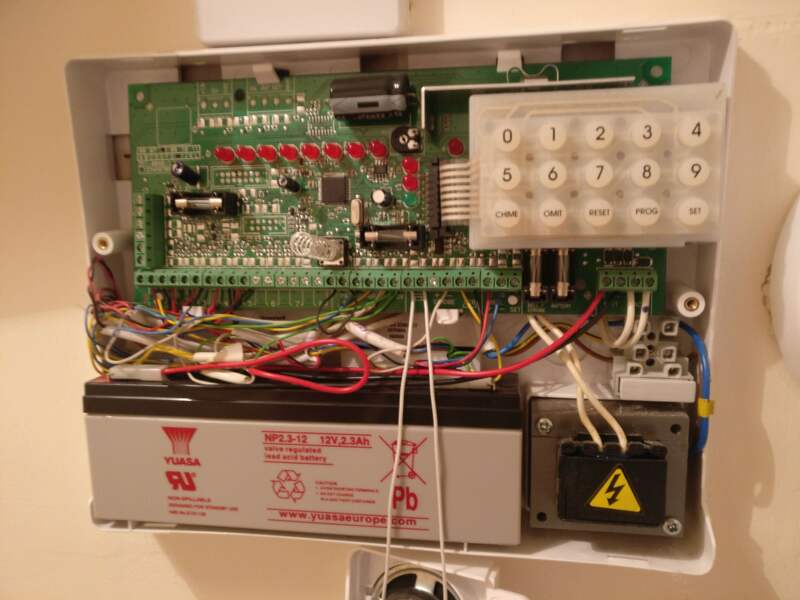 We know that there is no fault with the existing setup because the alarm used to work, so we can start to diagnose our four potential issues. I’ll also teach you how to reset your panel. This step is the easiest but can be daunting for some. Remember, safety first. We will be dealing with a panel that may be receiving mains voltage. When we open the box, there is a small spring that pushes against the door, this little spring ensures that any burglars who attempt to open the panel, trigger the alarm. 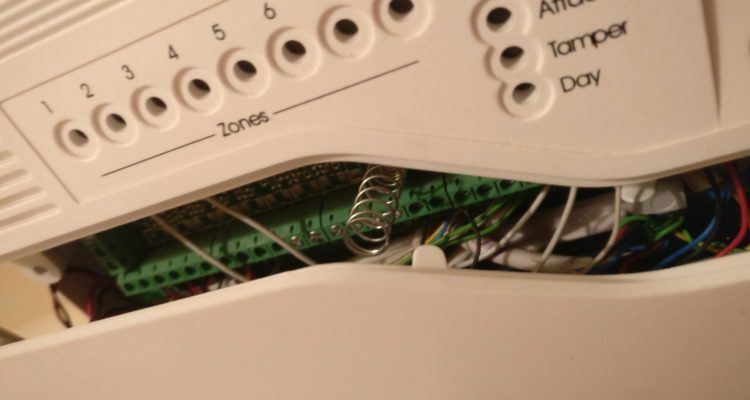 As our alarm is not working, nothing will happen but if the alarm does sound, then it may be a sign that your panel does not have a power issue, consider resetting your alarm. Unscrew the two front facing screws. Note that from here on out, experienced competent people should continue. Now that we have taken the bottom section off completely, we need access to the top of the main board as well. There is a fuse we need to test in the top half of the alarm panel so we’re going to remove the top half as well, this bit is just as easy as the bottom half, but there is a speaker attached to the housing, we can remove the speaker by unscrewing the terminals or do what I did and simply let the top half dangle by its wires (lazy but effective). Firstly we need to test that the incoming power supply is working, this is where our AC Voltage tester comes in (fear not if you don’t have one but do have a voltmeter). Place the wand near the incoming mains wire, if the wand sounds and flashes, congratulations. We have determined that the alarm panel is receiving power to its transformer. If there is no power, consider using a voltmeter as explained above to verify. If there is still definitely no power then a fuse may have blown in the isolation switch or the ring main RCD may have tripped, so consider diagnosing if they are the issue. 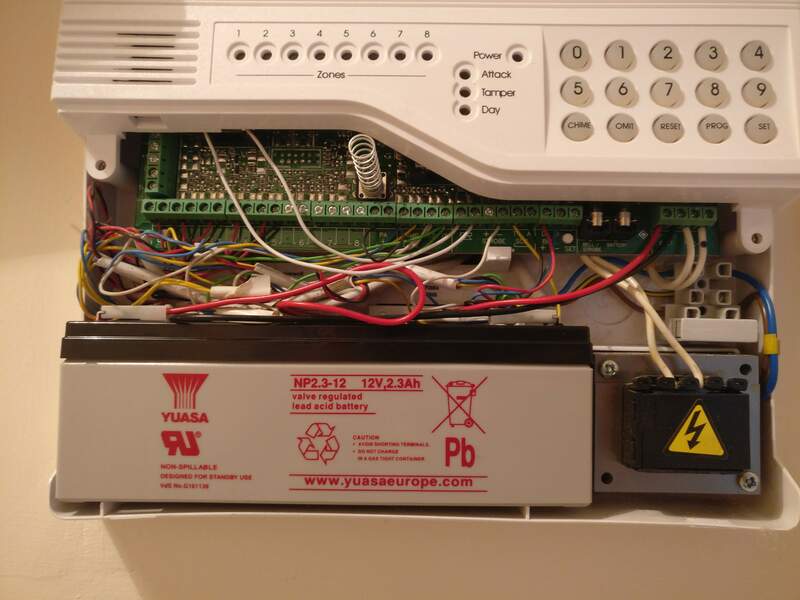 If you think that the Accenta / Optima alarm has stopped working due to a battery failure, we can test the battery by connecting test leads to the battery terminals on either side of the battery block or on the battery directly, you will need to turn off power to the alarm so that we don’t get the feed in voltage from the board. Do not put your voltmeter test leads in the red highlighted section. Make sure to set your voltmeter back to measuring DC voltage if you set it for AC earlier. 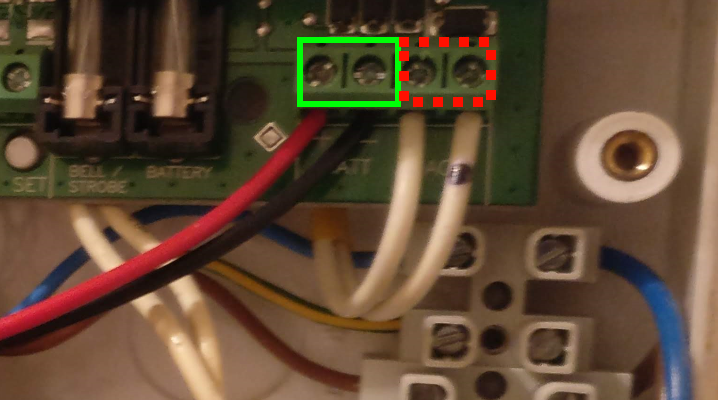 Place your test leads on both screws on the green highlighted area. If you don’t get a reading or a low reading (3V or less) then your alarm battery may have ran out because of power failure. If your battery reads ~12V then it is a good indicator that your alarm panel is faulty and will need to be replaced entirely, but I would suggest you check the fuses before doing so to verify. 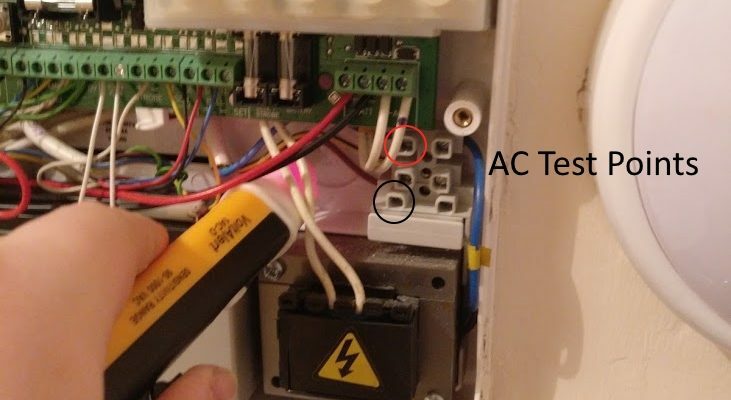 If you have verified that the incoming power is working and your alarm battery is depleted then a fuse is a most likely cause of the alarm failing. To test the fuses, you need to set your voltmeter to continuity mode and then test each side of the fuses contacts. Make sure the power is switched off before and during testing any fuses. If any are blown, replace like for like. To reset the alarm panel, remove power to the panel and short the SET output to the left PA input terminal. Then turn on the alarm and allow it to power up completely. 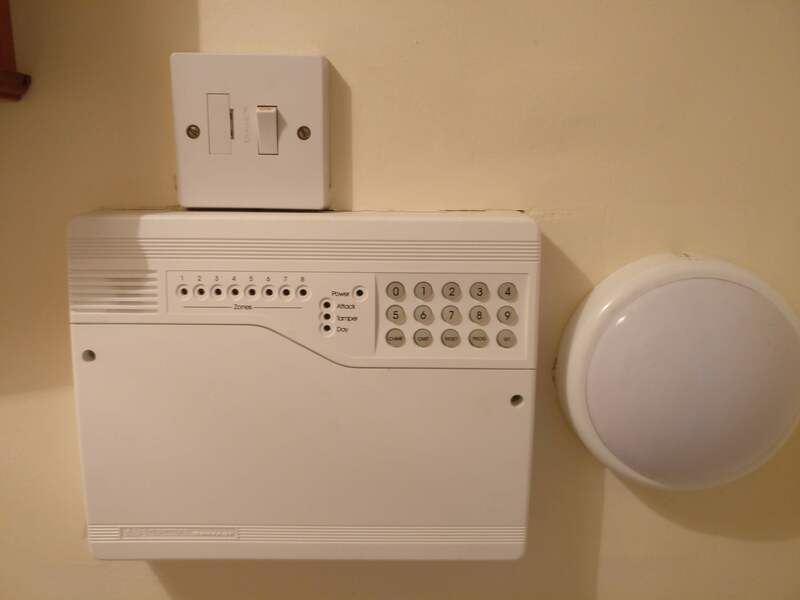 After a few seconds, you can then switch off the alarm once again and remove the shorting wires. Make sure to replace any wires previously installed and then power up the unit again, the default 0123 code will now have been restored. Beware in doing this, you reset any zones, such as fire zones will have been reset.